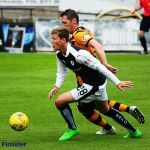 Raith Rovers got back to winning ways this afternoon at Stark’s Park, seeing off the stubborn challenge of Alloa Athletic with a resounding 3-0 victory. 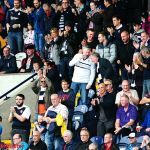 The feel-good factor generated by Rovers’ opening three-goal win against Livingston had been diminished somewhat by subsequent reverses at the hands of Falkirk, and then Stenhousemuir in the Petrofac Cup, but Ray McKinnon’s men emerged today clearly determined to put those recent disappointments firmly behind them. 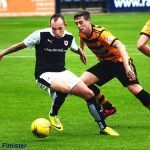 Not that an easy game was anticipated by any means, given that Danny Lennon’s men also had a point to prove, having lost their opening two league matches of the campaign, this having been compounded by also being removed from the Petrofac tournament by a lower tier side, in their case Elgin City. That said, Rovers have enjoyed a decent return against the Wasps in recent times, having won five and drawn three of the last ten meetings between the teams. 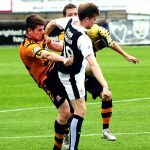 A decade has almost come and gone since Alloa last registered a win in the Lang Toun, so a degree of optimism could be detected in the air within the south stand as the teams emerged on a balmy, late summer afternoon. 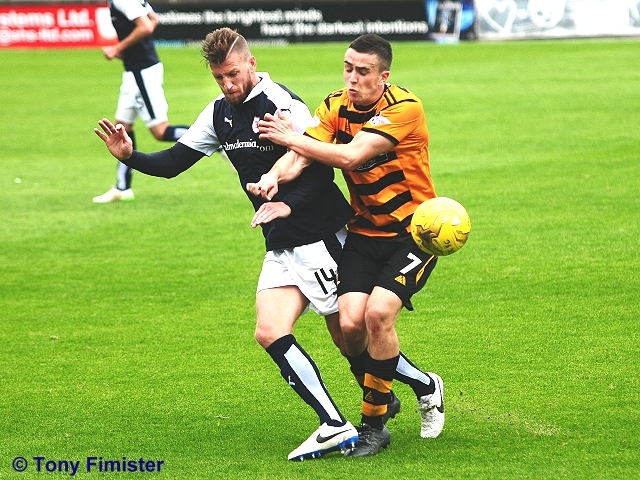 Alloa, of course boast former £5m striker Michael Chopra within their ranks, and the striker looked lively in the early stages, threading a fine pass through to striker partner Geoff Mitchell, who could only loft his shot wide of target with under a minute played. 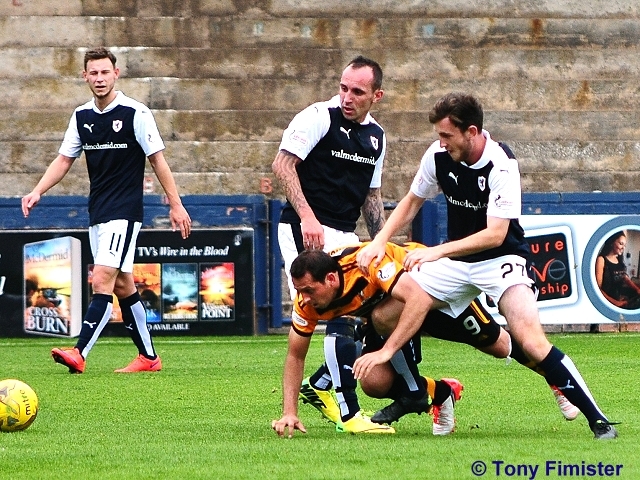 Moments later, however, Chopra could count himself fortunate to escape the wrath of the referee when he appeared to take a petulant kick at Iain Davidson, as the Rovers defender ushered the ball out of play. 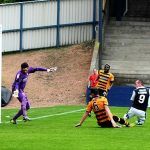 Rovers took time to develop momentum, although Mark Stewart was presented with a chance thanks to Ryan McCord’s wickedly floated pass, but the Rovers striker’s hesitation provided ample time for the defence to avert any danger. 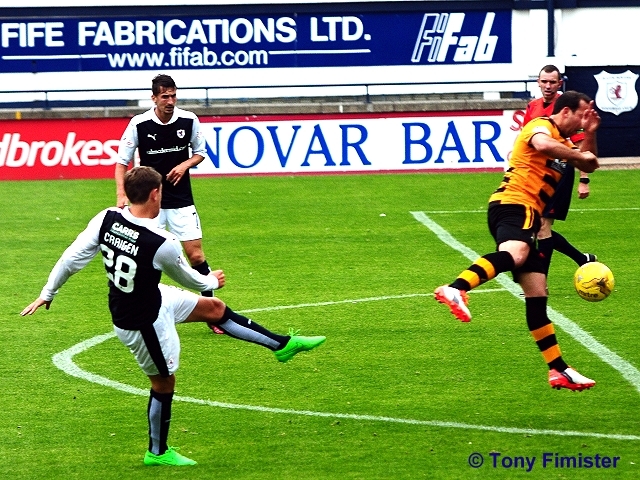 After ten minutes, Ross Callachan registered Rovers’ first attempt at goal when he chanced his arm with a speculative effort from thirty yards that was easily gathered by Alloa keeper David Crawford. Moments later, it was Craig Wighton’s turn with a shot from just outside the box that Crawford confidently clutched from just under his crossbar. 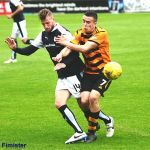 Alloa midfielder Michael Duffy’s mobility and direct approach demanded the close attention of the Rovers rearguard. Davidson’s quick thinking denied Duffy a goal-scoring opportunity, before the same player sent a shot just wide of goal with Kevin Cuthbert scrambling across his goal line. For all that, however, it was the home side that began to stamp its authority on proceedings midway through the first half, forcing a series of corner kicks that pegged their opponents deep into their own half. 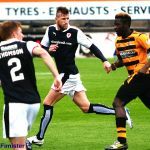 McCord’s floated crosses caused much consternation within the visitors’ ranks, and from one botched clearance Jason Thomson took control of the ball, although his drilled cross into the Alloa box failed to find a blue-clad predator. At the other end of the field, the small band of away fans housed in the main stand demanded a penalty when Duffy’s cross appeared to strike the arm of the retreating Callachan, but referee Kevin Graham waved away all protests. To say that a penalty award would have been soft would have been something of an understatement. 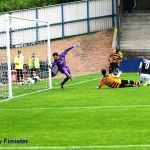 On the half hour mark, James Craigan’s shot was deflected high and wide from a promising position, as Rovers continued to assume the ascendancy. 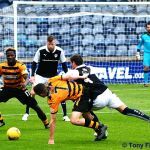 However, for all their territorial and possession dominance, chances were at a premium, and Alloa looked dangerous breaking forward on the counter attack. 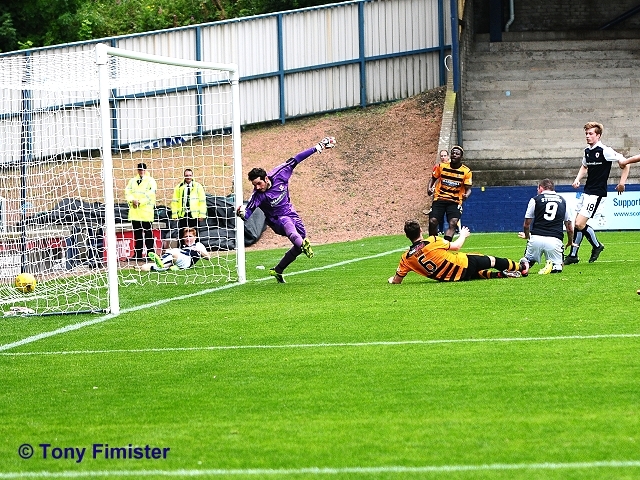 Ten minutes from the break, Rovers’ keeper was stung into action for the first time in the match, easily gathering Duffy’s shot from outside the area, although the Alloa midfielder was presented with a far easier chance two minutes later, when he volleyed wide of the target from a promising position when a deep cross evaded the static Rovers defence. As thoughts turned to half time pies and bovril, the visitors almost broke the stalemate, when a delicate Chopra cutback found Duffy lurking with intent on the edge of the box, but his well-driven shot was impressively parried round the post by Cuthbert. 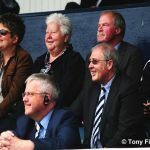 The second period started relatively benignly, but ten minutes in Rovers fashioned the game’s opening goal, and it was a strike of genuine quality, one which is unlikely to be bettered during this campaign. 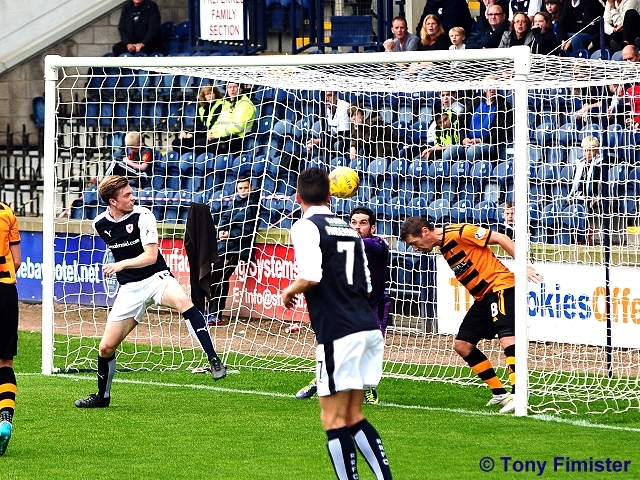 Ryan McCord’s corner kick was headed clear, and fell invitingly to Craigen around twenty-five years from goal. The Rovers midfielder controlled the ball on his chest, and fired a rising left foot shot high into the top corner of the net, giving Crawford no chance. A minute later the same player had another chance from a similar position, but rushed his shot this time, sending it high into the home stand. Given that he had lit up the match beforehand, he was forgiven his indiscretion on this occasion by the Rovers faithful. Rovers’ tails were up at this point, and they scented blood. 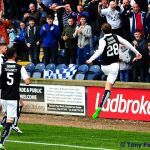 Sure enough, with an hour played they doubled their advantage, when McCord’s corner was met with a thudding header by Lewis Toshney, and Craig Wighton directed the ball into the roof of the net from close range with the minimum of fuss. 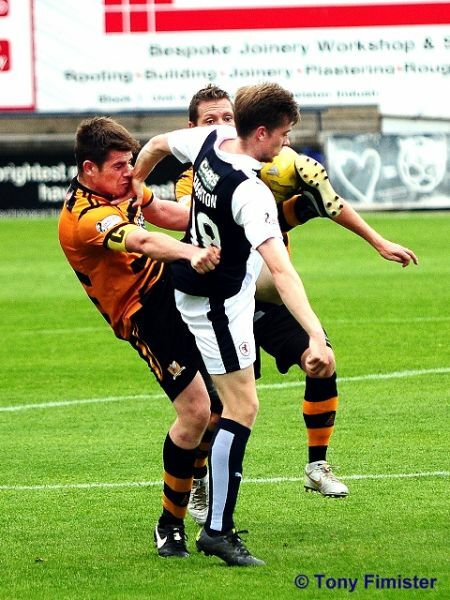 Alloa then pushed forward in a bid to get back into the match. 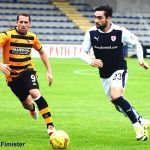 A Chopra snap shop just cleared Cuthbert’s crossbar before a double substitution by boss Lennon – Layne and Ferns entering the fray – sought to turn the tide in the Wasps’ favour. With twenty minutes remaining, it took an impressive last-gasp tackle to foil Craigen scoring his second goal of the afternoon, as Rovers sought what would surely be a game-clinching third goal. Grant Anderson continued to wreak havoc down the right flank at every opportunity, although the Rovers winger had to be replaced by Mitchel Megginson as the match entered its final stages. With five minutes remaining, Rovers put the result beyond doubt with a decisive third goal. Neat work between Megginson and the marauding Thomson led to a fine cut back from the Rovers captain, and Mark Stewart bundled the ball home from three yards out. The three points secured, there was just time for Rovers to bring on youngsters Sean Mackie and Kieran Campbell for a brief run, before the final whistle sounded. This was a match which was hard-fought, but ultimately a fully deserved three points for Rovers. 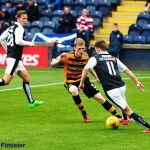 For the most part, the home side played with attacking intent and no little verve, qualities which will be required in abundance if tangible reward is to be gleaned from the next testing two league matches, with visits to Hibernian and Rangers on the cards. Welcome to Starks Park for today's Championship tie against Alloa. Both teams will be looking to bounce back from midweek defeats. 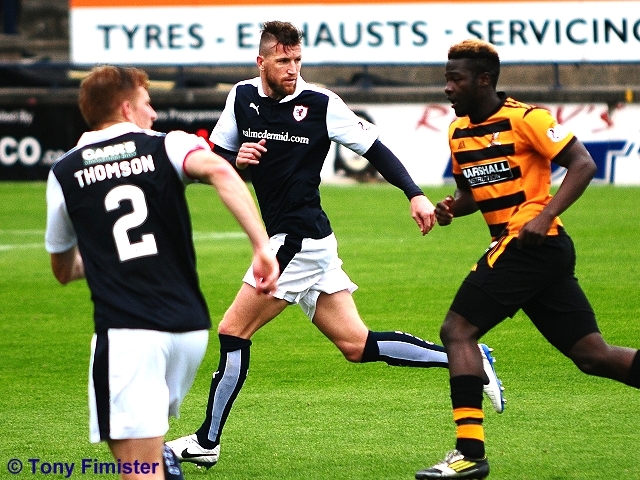 Jason Thomson is included in today's starting line up, further to Raith appealing his midweek dismissal. 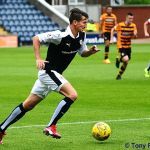 Dougie Hill returns to Starks park for the first time since departing in the summer, likewise Ryan McCord makes his first appearance against his former employers. 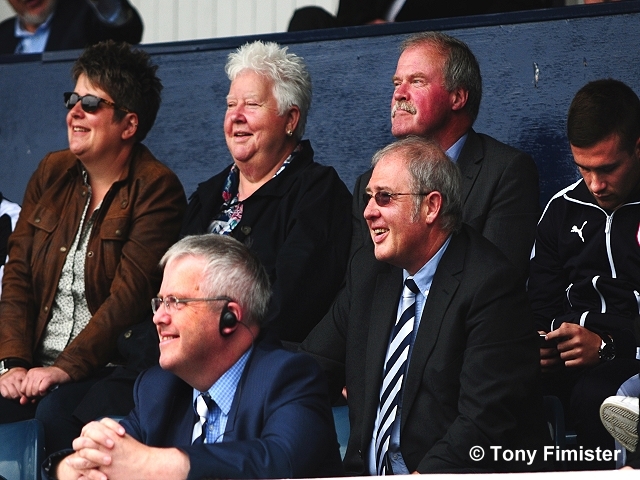 Former Raith goalkeeper Andrew McNeil is on the bench for today's visitors. 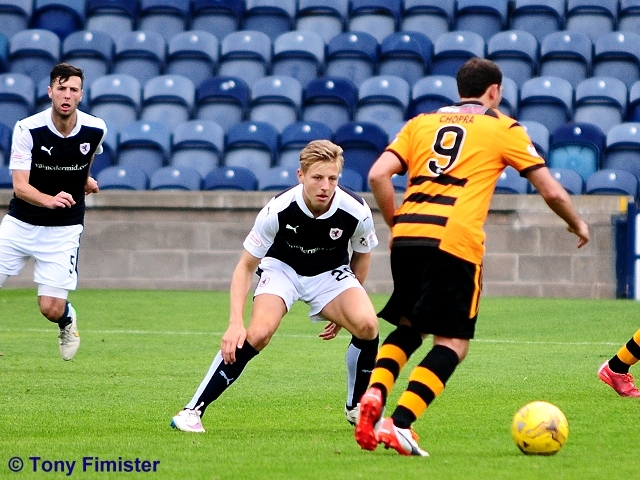 Raith get the match underway, shooting towards the McDermid stand. Early chance for Geoff Mitchell but his attempted lob goes over. Chopra with a late kick at Davidson, receives a warning from today's referee Kevin Graham. 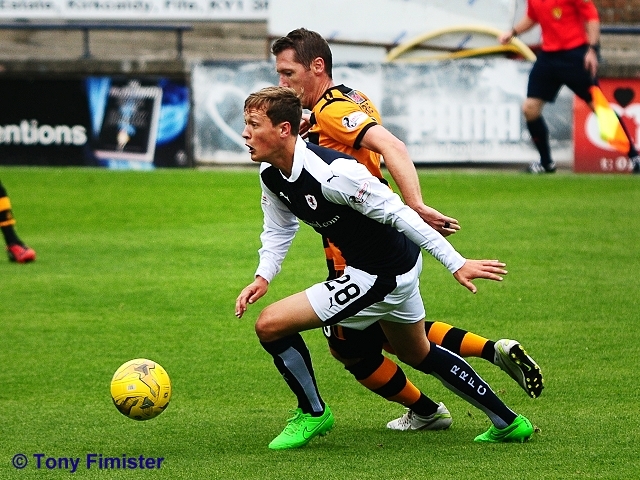 Iain Davidson playing at the back today, alongside Lewis Toshney. Ross. Chance for Wighton but his half volley from just outside the box was blocked and cleared. The game is relatively open at the moment with both sides trying to get the ball down, although both have also been guilty of a few misplaced passes. 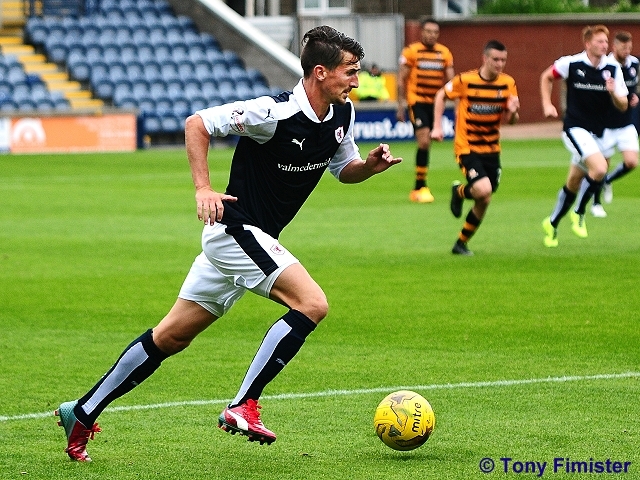 Ross Callachan tries a long range 'daisy cutter'. David Crawford gathers easily. Kyle McAusland's cross finds Chopra in the middle, his attempted turn and cross is well blocked. 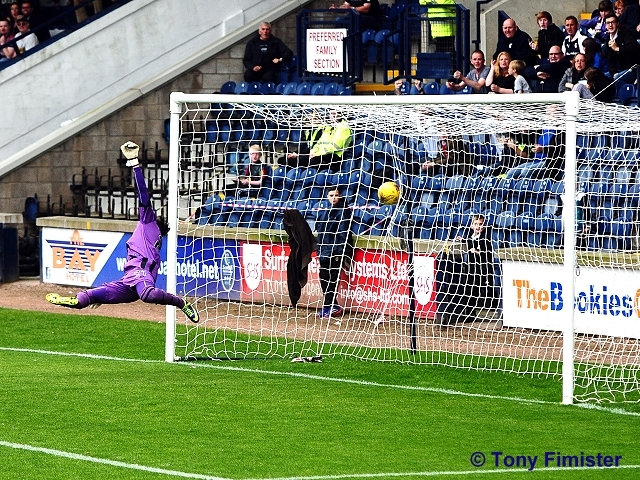 Craig Wighton's effort from range is too close to Crawford and he saves comfortably. 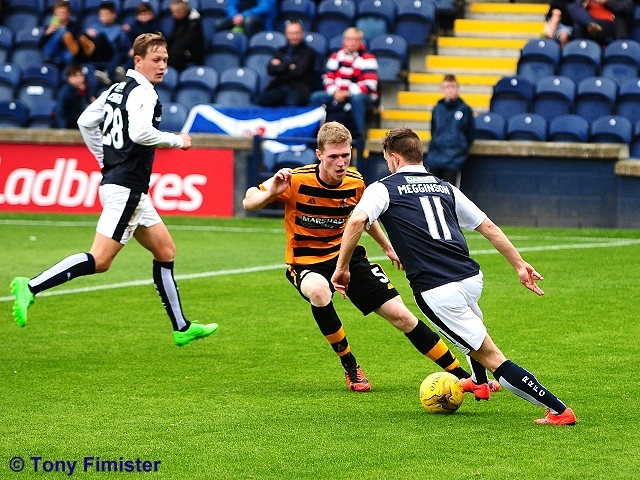 Alloa in the ascendency. Firstly, Duffy almost gets on the end of a through ball then Mitchell goes close with an effort from just outside the penalty area. 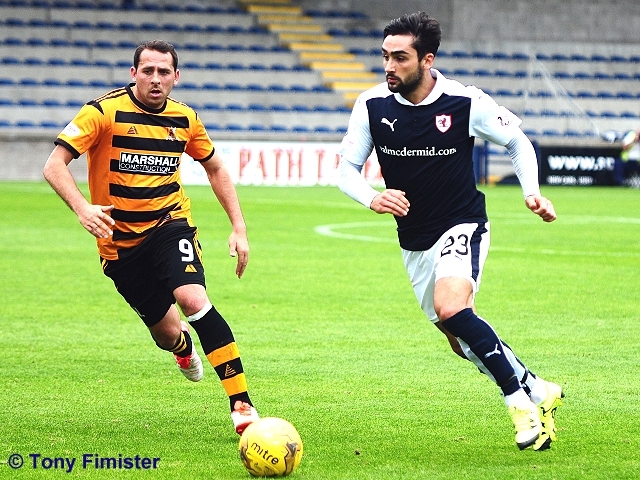 Two quick chances for Raith. Lewis Toshney with a glancing header going the closest. Jason Thomson does well to reach the byline but his cutback has no takers. Dougie Hill receives a hearty applause from both sets of supporters having returned to the field after taking a knock. Duffy drives a half volley into the box. The ball hits Callachan and drifts harmlessly to Cuthbert. Today's visitors, especially Geoff Mitchell, seem to be playing a high line. The aforementioned. Mitchell has now been caught offside more than once. 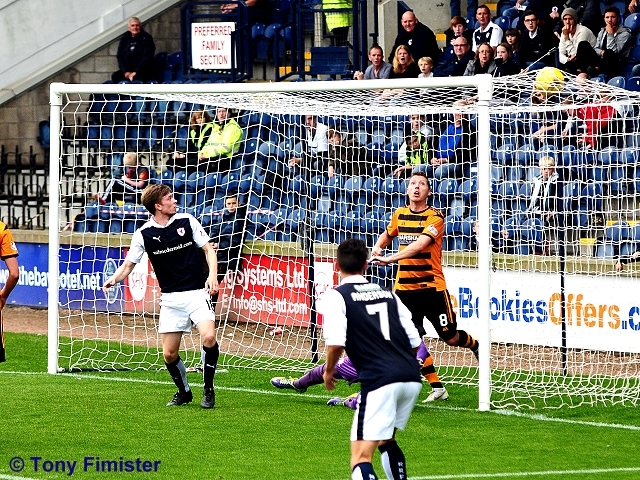 Craig Wighton does well to win a free kick after a surging run. McCord's attempted cutback is intercepted. 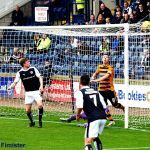 An effort from Craig Wighton from just outside the penalty box looked goal bound from the South stand, deflected wide for a corner. A good run from Anderson, popping up on the left wing, but his cut back trickles away harmlessly. It's end to end again! Firstly, Wighton goes close again with a run and shot before a Duffy drive is well held by Cuthbert. Michael Duffy is unmarked at the back post but he doesn't connect properly with the ball and his half volley goes out for a goal kick. 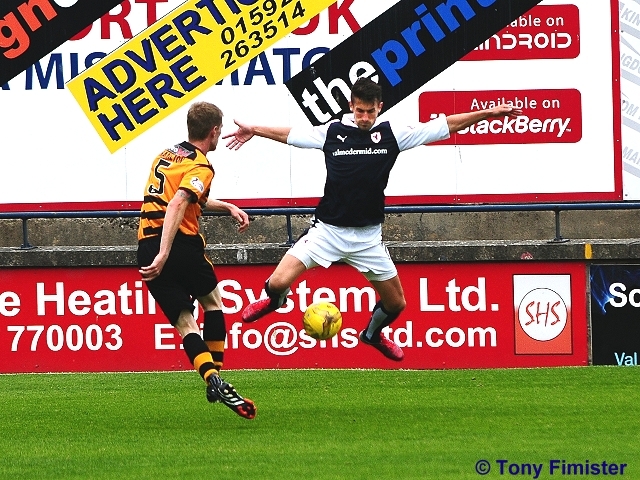 Mark Stewart caught fractionally offside. It looked a marginal decision that one! Good turn from Stewart, who releases Thomson for one of those lung busting runs. His cross is well blocked. The game isn't quite as frantic now. Both teams are struggling to keep the ball though with several passes going astray. McCord this time with a long range effort, easily held by Crawford. Connor McManus with a strong drive from just outside the box. Well saved by Cuthbert, low to his left. 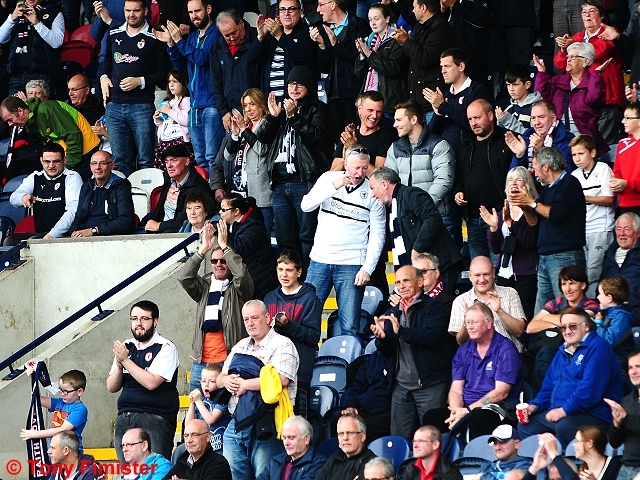 At 59% Raith are enjoying the majority of the play. Most of their 9 shots on goal have been from distance and nobody has been able to get on the end of any of the 5 corners awarded. WHAT A GOAL! A good corner in from McCord but is headed clear but Craigan took the ball on his chest a volleys it into the top corner from about 20 yards out! 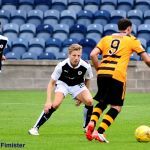 After two successive defeats on their travels, Rovers will be hoping for a reversal in fortunes this weekend, when they host Alloa Athletic at Stark’s Park. Both clubs go into the match on the back of disappointing eliminations from the Petrofac Training Cup to lower league sides. 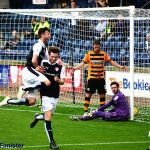 On Tuesday evening, Raith lost out to Stenhousemuir, after a second half goal from Allan Cook, was followed up by a spectacular finish from Stephen Stirling, handing the Ochilview club a 2-0 win. 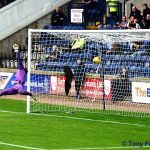 On Wednesday, Alloa lost out by the same scoreline to Elgin City, with penalties from Craig Gunn and Marc McKenzie in extra-time, producing a surprise triumph for Jim Weir’s League Two outfit. 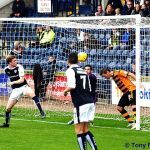 You have to go back to 2006 to find Alloa’s last win at Stark’s Park, a 1-0 result in a Second Division season which saw the Kirkcaldy club finish seventh, while Alloa finished ninth, but stayed up after defeating Berwick Rangers in the play-off final. 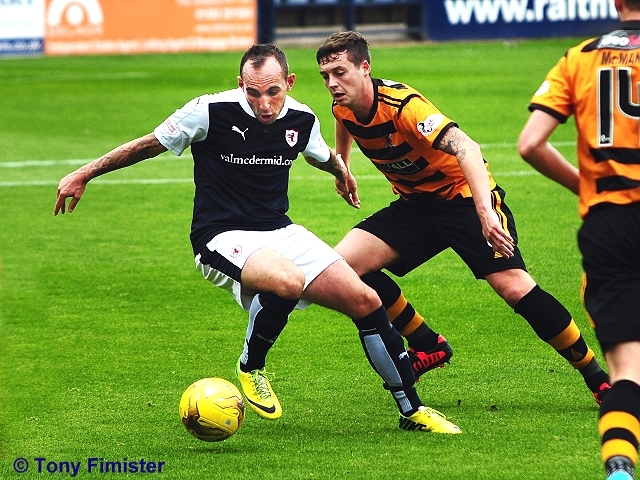 Raith were unbeaten against their Clackmananshire opponents last season, with two wins and two draws. 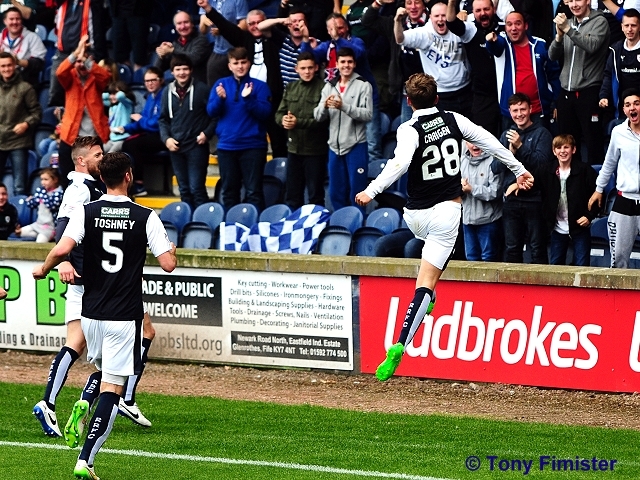 An early Ryan Conroy goal was enough to secure all three points for Grant Murray’s men in their first meeting twelve months ago, but the points were shared two months later at Stark’s Park, when Grant Anderson brought the scores level after Liam Buchanan had opened the scoring for the visitors after quarter-of-an-hour. 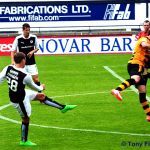 A reasonably incident free 0-0 draw was played out at a bitterly cold Indodrill Stadium in January, and Rovers won the final meeting of the season in March by two goals to one, with Lewis Vaughan and Mark Stewart registering for Rovers, while Buchanan was again on the mark for Alloa. 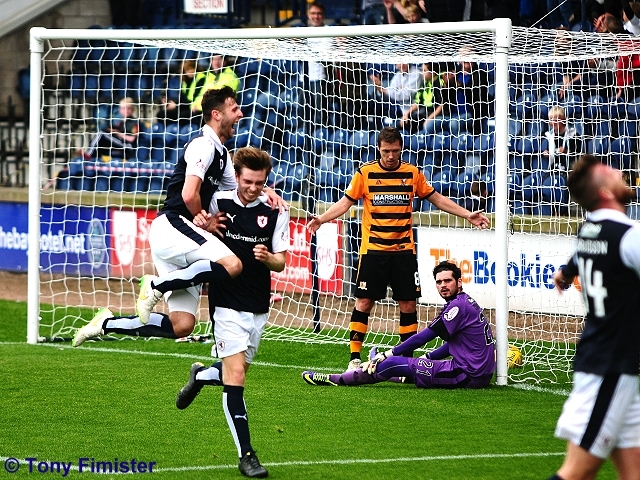 As a result of this, Raith Rovers have an impressive recent head-to-head record between the sides, with five wins, and three draws from the last ten meetings.